When senior pitcher Liz Ward boarded the bus at Greencastle-Antrim on Thursday afternoon, she knew she was going to have to adjust to the high temperatures after a cold and rainy regular season. Forty-five minutes later, when she stepped off the bus at Carlisle for a District 3 Class AAA softball quarterfinal against East Pennsboro, she knew she had to adjust to more than just the heat. "Coming into this game, I wasn't expecting it to be this hot and humid," Ward said. "It wasn't that bad down in Greencastle, and as soon as I got off the bus, I was just like, 'Ohh, my god.'" But Ward held the Panthers at bay, and Greencastle's offense backed her up quite well to punch its ticket to the semifinals with a 10-4 win. The Blue Devils (17-5) will face Garden Spot (14-7), which was a 1-0 extra-innings victor over Kennard-Dale. "Liz pitched one great game today," G-A coach Mark DeCarli said. "In the beginning, she was finding her groove, and the last three or four games, she's been doing real well for us. She knows she's a senior, so this is it for her. She has gotta be a leader, which she has been, and I'm proud of her." Aside from the sixth inning, when East Pennsboro (15-4) made an abbreviated attempt a comeback, Ward was nearly unstoppable. 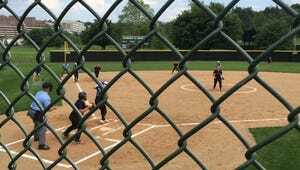 She scattered seven hits - four of which came in the Panthers' four-run sixth - and fanned seven batters. Despite some obvious frustration, Ward managed to get G-A out of several jams, as East Penn left five stranded in scoring position. "I struggle when it's even a little humid, but I pulled it together today," Ward said. "My speed was working today. I was really using my legs, and I think they couldn't really catch up to me. "Abby (Reitz) made some good plays at short, Mackenzie (Oberholzer) made that really good diving play (to turn a double play in the seventh inning), so there was some really good defensive plays that held us together, too." It wasn't just the defense that backed Ward's effort. The Blue Devils finished with 11 hits, and by the end of the third inning, they led 8-0. Jess Root, Ally Brown, Alicen Hoover and Oberholzer all finished with two hits apiece. "We're finally realizing that we need hits to win the game," Oberholzer said. "The defense and pitching can't do everything, so we needed to get runs early and keep the pressure on." Greencastle certainly did that. It was held scoreless in just two innings, and Hoover smashed a two-run home run in the sixth inning to give G-A all the insurance it needed.